It’s our community pick of the week! Last year, the Thanksgiving classic—sweet potato casserole—celebrated its 100 year anniversary. 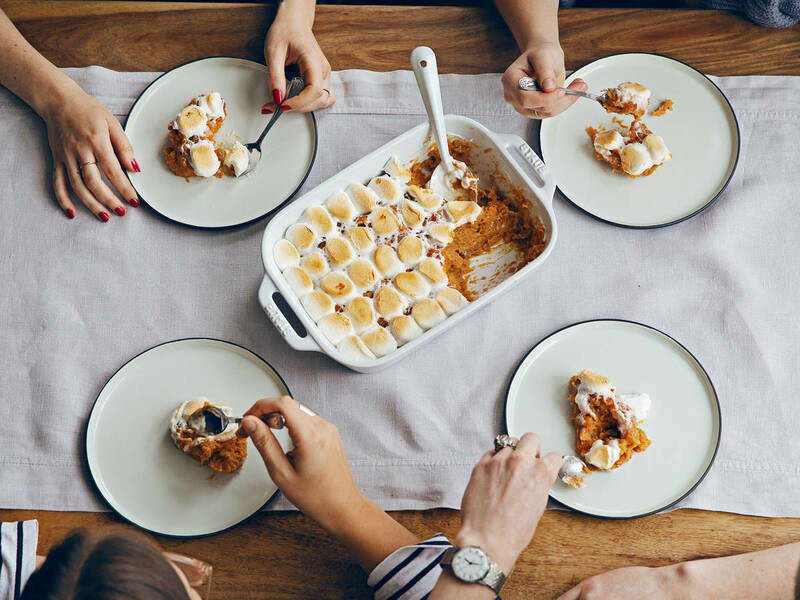 Said to have been first published in 1917 as part of an effort to push the sale of marshmallows in the US, the dish riffed on the already popular glazed or candied ‘yams’ and has been a fixture of the Thanksgiving table ever since. Be that as it may, for many of us outside of North America, the combination of marshmallows, peanut butter, and sweet potatoes, as a side to the usual savory suspects—turkey, mash, green bean casserole and stuffing—is a little bewildering. But just in time for Thanksgiving, which falls on the fourth Thursday of November (that’s November 22nd this year), we received a recipe for the American classic from our community member, Holly—passed down from her grandmother. And so, tradition beckoned. Holly’s grandmother’s recipe combines all the classic elements of a sweet potato casserole—besides the vegetable themselves, there’s maple syrup, brown sugar, peanut butter (sometimes pecans are used, too) and the signature marshmallow topping. If you’re throwing Thanksgiving this year, be sure to check out our no-sweat guide to hosting on the day—which includes everything from a handy timeline planner to our best recipes for the classics. How does your family make the sweet potato casserole? Tell us your Thanksgiving tales in the comments!